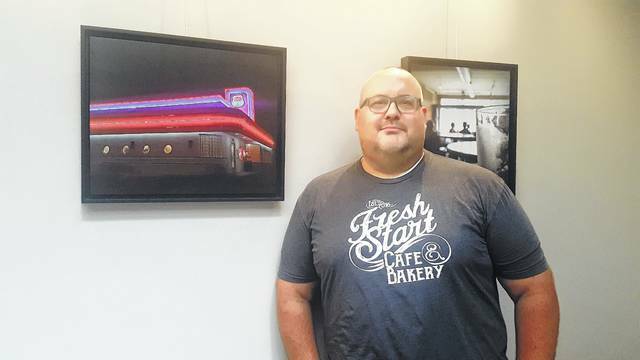 Todd Daughenbaugh poses with artwork from local artists at his business Fresh Start Cafe and Bakery, 24 N. Sandusky St., in downtown Delaware. He celebrates the eatery’s one-year anniversary on Saturday. Todd Daughenbaugh’s downtown eatery will celebrate its one year anniversary of offering a fresh start for its customers. The Fresh Start Cafe and Bakery, 24 N. Sandusky St., will honor the occasion with a variety of events special deals from 12:30 to 9 p.m. Saturday. “We’re going to have a little party,” Daughenbaugh said. Creation of the 2,700-square-foot eatery, which features a selection of muffins, cookies and cakes as well as specialty coffees from its Columbus-based partner Crimson Cup, was also a fresh start — pardon the cliche again — for the owner. Daughenbaugh and his wife, Leigh, have been Delaware residents since 2002, but had commuted to Columbus for work until last year. For more than 10 years, he not only wanted to have his own business, but to also become more connected with the community. He’s excited to celebrate the milestone and looks forward to another year in business. He’s refining his vision for his team. “Year 1 was survive. Year 2 is thrive,” Daughenbaugh said. But the first-time business owner’s attention has not only focused on his cafe. He’s helped raise funds for nonprofit organizations such as the Grace Clinic and has participated in community meetings about downtown parking and a designated outdoor refreshment area that Delaware City Council is considering. “Part of my goal is to connect with the downtown and become part of the community,” Daughenbaugh said. During the celebration, the cafe will sell drinks for $1 with free face painting from 1 to 4 p.m. for children and adults. There will also be a pie-eating contest at 1:30 p.m. The Fresh Start baking team and baristas will participate in the first two events of the pie-eating contest. The next pie-eating event will include local business owners Terri-Lynne Smiles of the Greater Gouda, Chris Schobert of Olivina and Richard Upton of J. Gumbo’s. Main Street Delaware Executive Director Susie Bibler will square off against Delaware City Attorney Darren Shulman and another yet-to-be-determined contestant in the final pie-eating event. Additionally, the bakery will have raffle prizes every hour for those who sign up for its electronic newsletter. Prize winners do not have to be present to win. “We’re looking forward to another good year,” Daughenbaugh said.